Mar 5 flank steak: tucked and rolled. 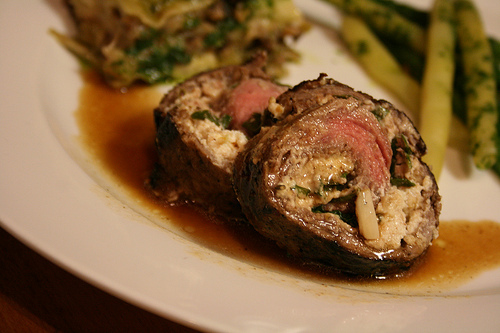 I had so much fun making this rolled steak. Sure, I splurge on the finer cuts, but weekday and budget-practical meals means 'less choice cuts' make more regular debuts. This is one of my favorite ways to serve up a gussied up flank steak. I played around, filling it will different innards. My favorite lining was a mixture of bread crumbs, goat cheese, garlic, Parmesan and arugula (I didn't measure; I just shmooshed together a bit of each until I had a semi-spreadable texture, then topped with fresh arugula and rolled). I took the flank, popped it under saran wrap and pounded it thin. I dotted it with paper towels. Once dried, I sprinkled it with salt and pepper, and spread on some minced garlic. I then put on a creamy cheese mix (bread crumbs, goat cheese, Parmesan, Italian seasoning or fresh thyme, S&P) and fresh arugula, rolled it, tied it and seared it in a skillet over medium high heat. After it was nicely browned, I put it in a dish and tucked it into the oven for another 15-20 minutes at 350. I let it rest (so the juices can re-distribute); I took all the juices and made a sauce (more on sauces later). Once the meat had rested, I snipped off the strings and sliced the meat into handsome circles. Who said anything about weeknight meal? Special Note: winner of Westminster Crackers (number generated by random.org; very cool site where you just enter the range and it generates a number!) was comment #4: Krista from Rambling Tart. Congrats Krista! Westminster is popping crackers int he mail for you! Aug 16 Sausage stuffed Bell Peppers.